Rich in costume and culture, the villages we pass through on our way to Namche Bazaar allow us peeks into this famous Sherpa lifestyle and culture. 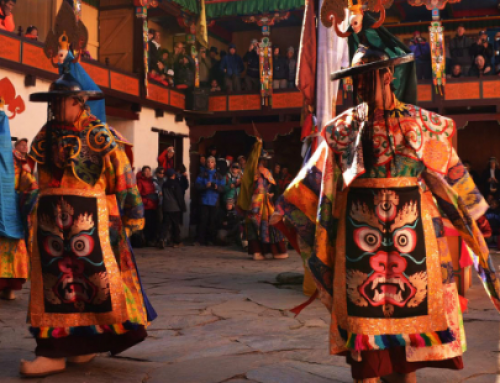 Buddhist prayer flags, the hallmark of all Sherpa and Buddhist communities are found in every village. Mani stone walls and prayer flag poles that line our trails should all be passed on the left, in a clockwise fashion, as it is believed that this generates good karma for the journey ahead. The colorful Saturday market in Namche Bazaar shows off the busiest commercial center of the Khumbu region. 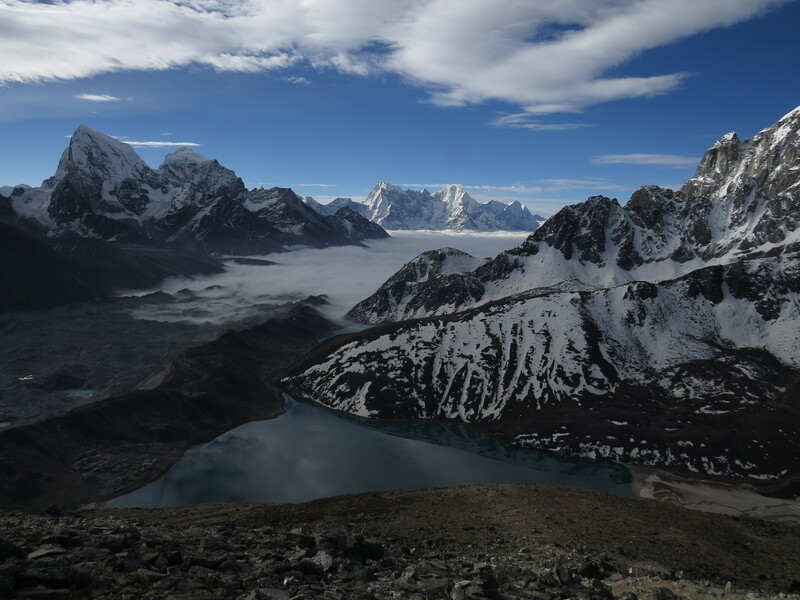 At Sonasa, the Gorko valley separates from the main Khumbu valley and now, instead of the view being dominated by Everest, it is dominated by another 8000m peak, Cho Oyu, the world’s sixth highest mountain and one of the less technical 8,000m peaks to climb. 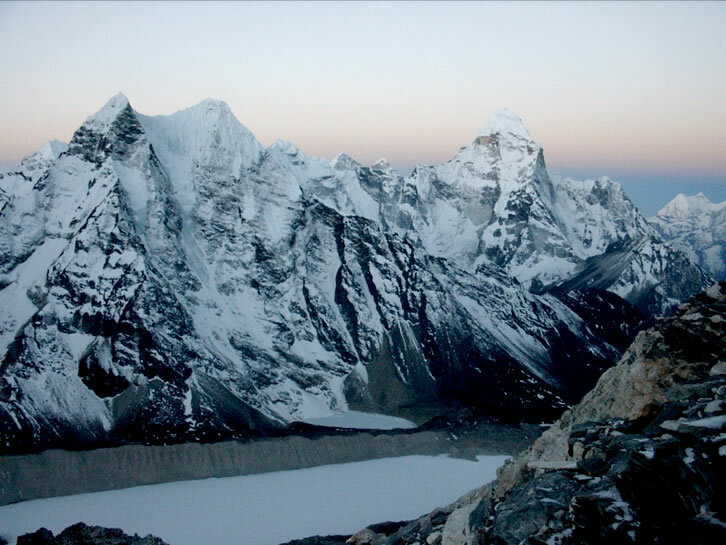 Early ascents were made from the Nepal side; now the usual way to the summit is via the north side in Tibet. 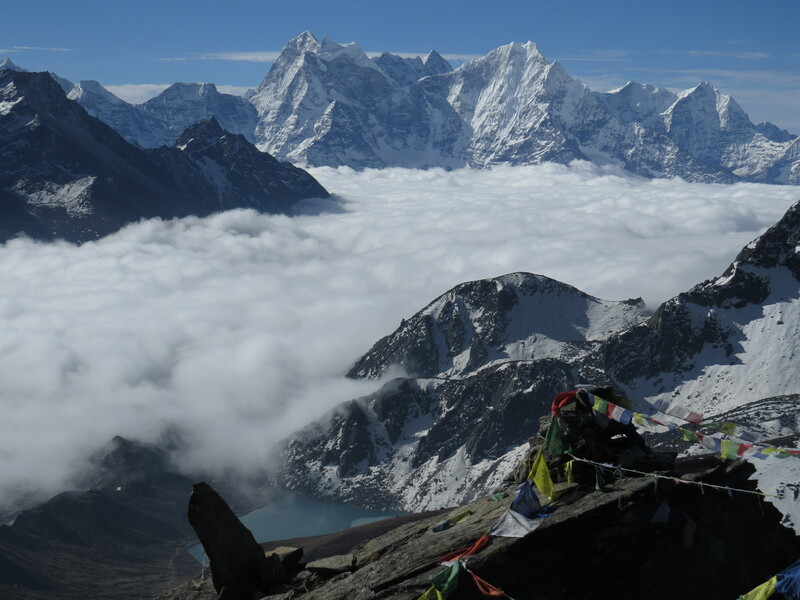 Once in the upper Gokyo valley, the trail passes the Gokyo lakes. 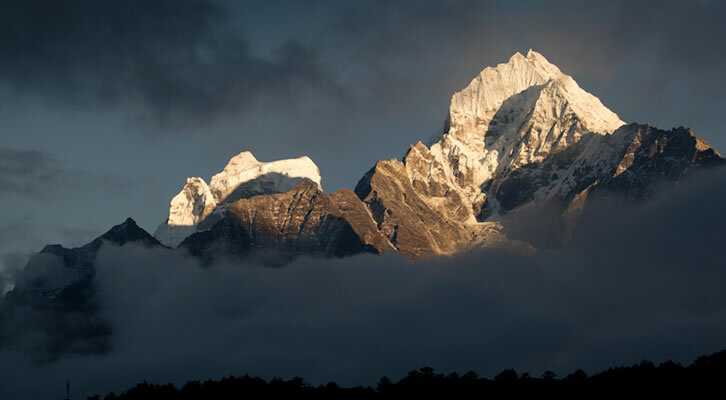 Their vivid turquoise-blue color gives a spectacular foreground to the sharply pointed mountains to the north. 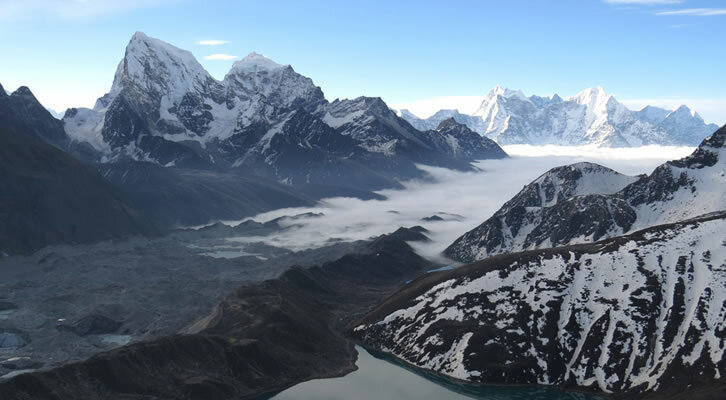 An ascent of Gokyo Ri provides breath-taking views of the mountains straddling the Nepal – Tibet border. 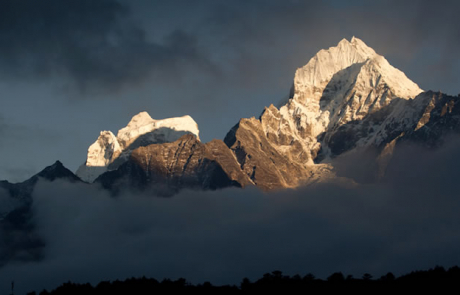 The great British explorer Bill Tilman referred to this area as, ‘The grandest 30 miles of the Himalaya’. 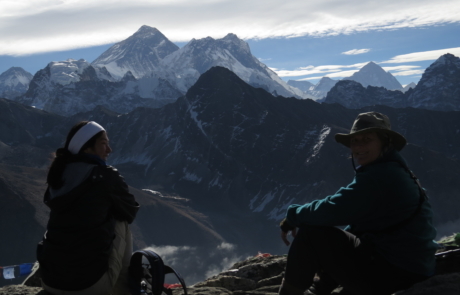 To reach the main Everest valley we now cross the Cho La 5,420m (17,782 ft), which connects the village of Dzongla (4830 m) to the east with the village of Thagnak (4700 m) to the west.. a truly memorable experience. 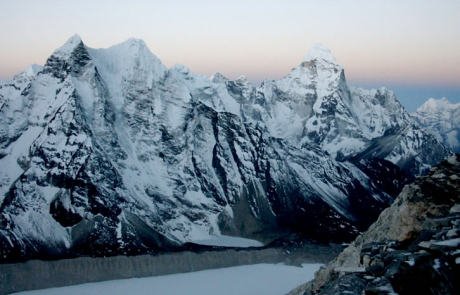 From the Gokyo valley side the pass looks to be an impossible barrier. 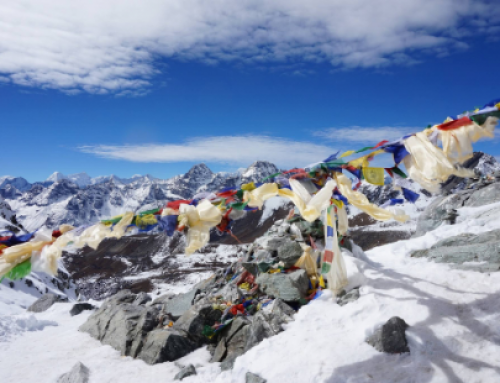 Here the trail winds its way through glacial debris, climbing steeply toward the summit that suddenly appears festooned in prayer flags. 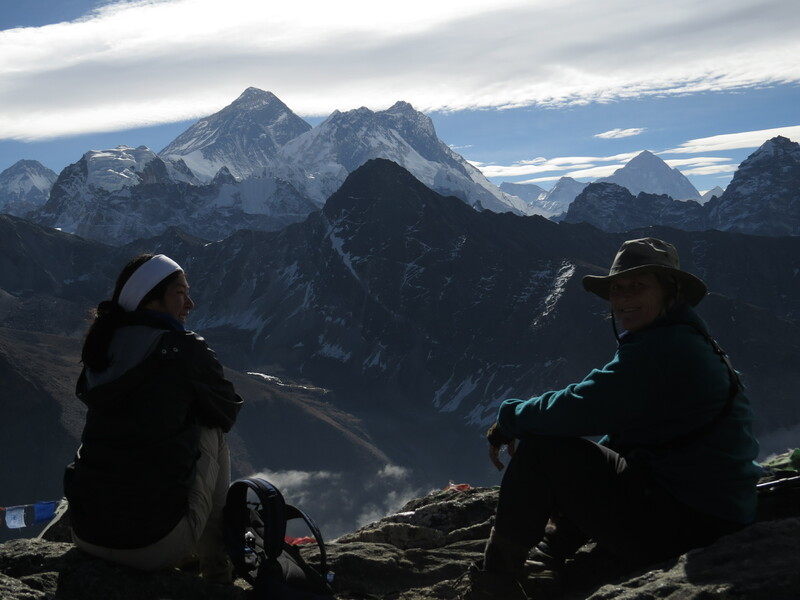 The trekker gets a real feeling of being amongst the great Himalayan peaks before dropping down to the Everest valley. 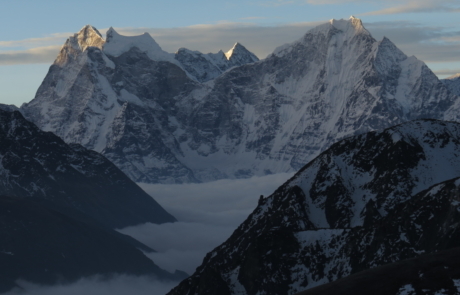 Once on the Khumbu side of the ridge, the trail winds through barren the landscape for another two days before reaching Gorak Shep, the site of the 1952 Everest Base Camp. With the retreat of the glacier, today’s base camp is another short day’s walk to the foot of the Western Rim and the Ice Fall. 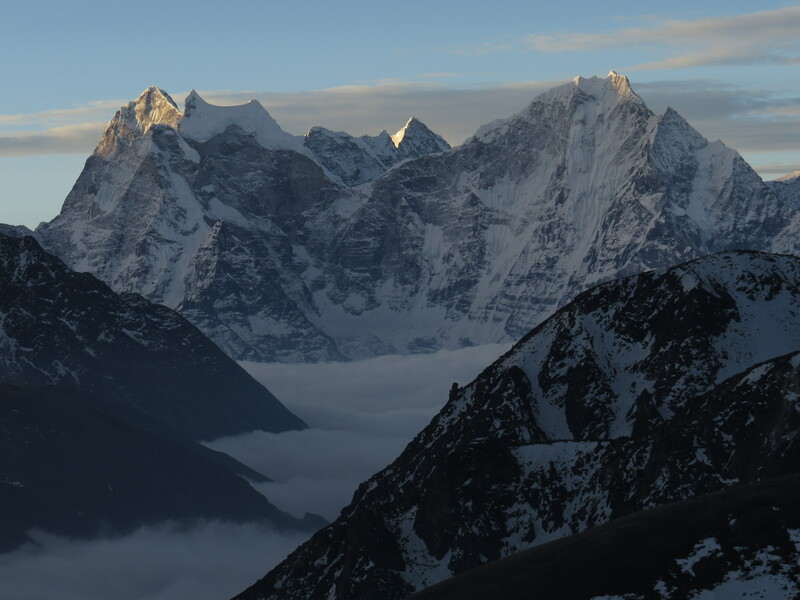 However, the best view of Everest from this valley is from the top of Kala Pattar. 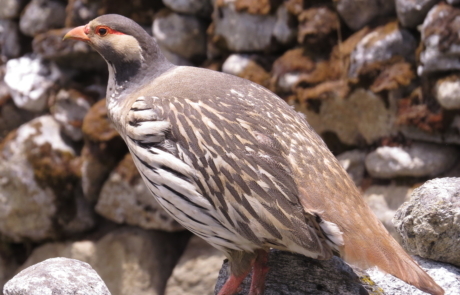 The climb looks easy but the altitude makes it quite an undertaking; however, the summit views make the effort very worthwhile. 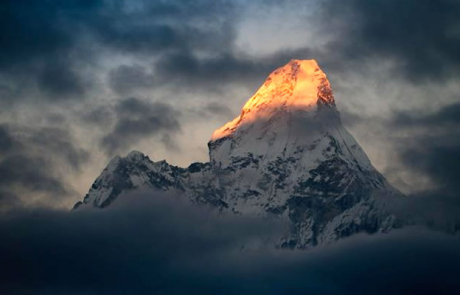 This trek is considered an experience of a lifetime from adventurous as well as the spiritual perspective. 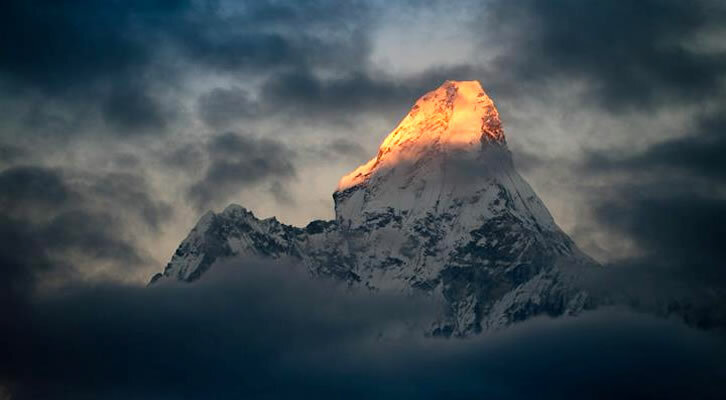 There will be ample opportunity to spend time to offer your prayers to sacred peak of Mount Everest, “Kaushiki” in Hinduism and “Quomolongma” in local Sherpa language. Touching or sprinkling water of Gokyo lakes is considered as holy act, which helps to cleanse sins of a lifetime. DAY 2: A detailed briefing for the trek and guided sightseeing to explore Buddhist monasteries, Hindu temples & medieval Durbar Squares. 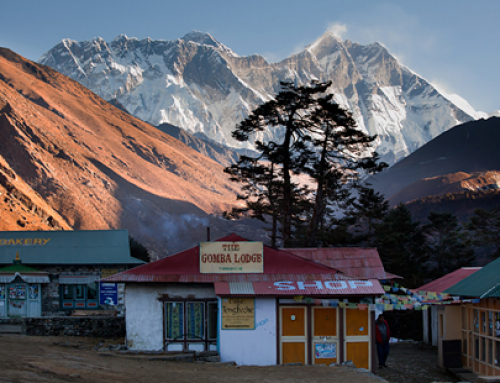 DAY 4: Trek to Namche Bazaar, the administrative capital and Bazaar of Sherpa people of the Khumbu Region (3,440m). 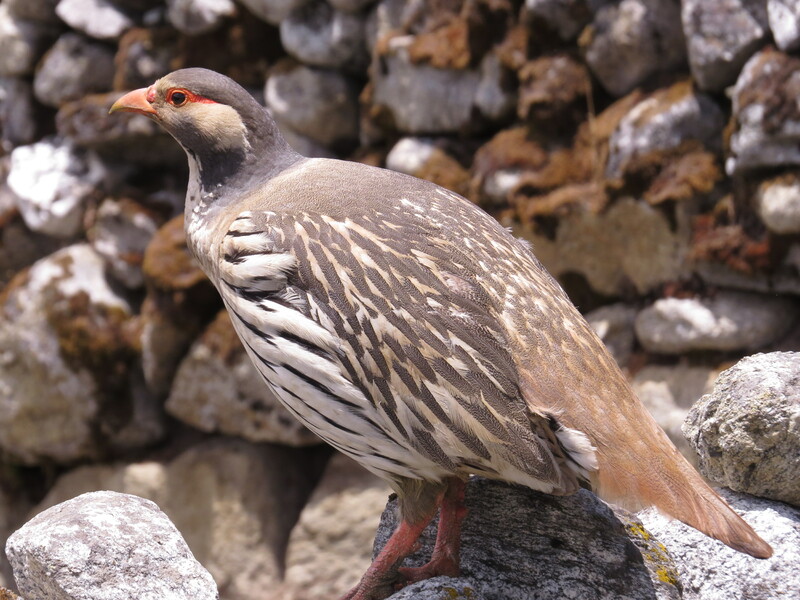 DAY 8: Rest day with a side trip to Chhukung Valley for acclimatization. 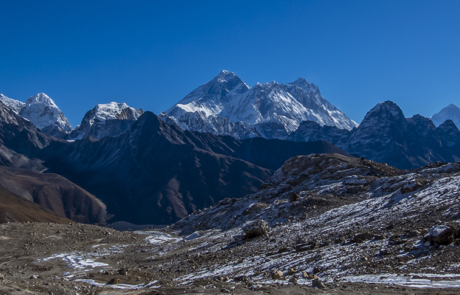 DAY 11: Hike to Kala Pattar (5,550m) and trek to Dzonglha (4,830m). 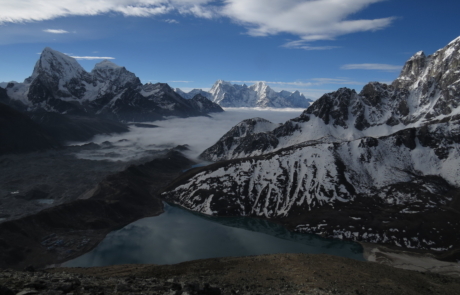 DAY 12: Cross over the Chola Pass (5,370m) and trek to Gokyo Lake (4,770m). DAY 13: A day in Gokyo Lake with an optional walk to 5th Lake. 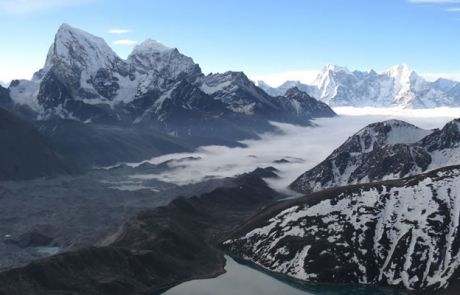 DAY 14: Hike to Gokyo Ri (5,370m) and trek to Dole (4,200m). 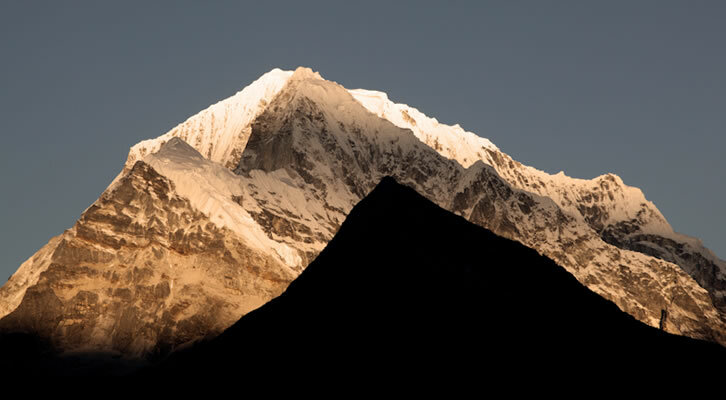 DAY 15: Trek to Namche Bazaar (3,440m). 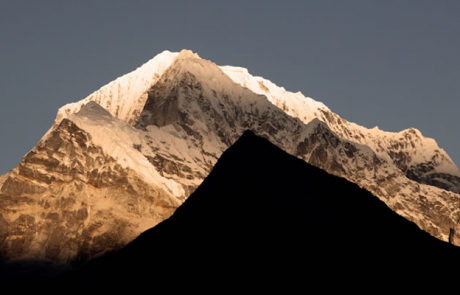 DAY 16: Trek to Lukla (2,840m). DAY 17: Fly to Kathmandu Airport and drive to the hotel. DAY 18: A contingency day just for incase. DAY 19: Transfer to the Kathmandu Airport for the flight to home.